Nintendo continues its defense of a deteriorating position in handheld game consoles by bringing Hulu and new 3D media capabilities to its 3DS game unit. The company announced on demand paid TV service Hulu Plus will be available on the 3DS by the end of the year. The $7.99/month premium app will also come to the Wii console and will stream the thousands of archived TV episodes and next-day show access, a Hulu specialty. The 3DS already has Netflix available on deck. With its dominant position in the world of dedicated handhelds, Nintendo has had the most to lose as smartphones steadily eroded the market for portable gaming. While the company reported recently that it has sold 50 million units of its popular DS consoles, the latest iteration of the series, the 3DS, has been a disappointment. Nintendo cut back pricing on the unit earlier this year, but the 3D capabilities of the new version have not had enough appeal to beat back the juggernaut that is app-based smartphone gaming. Struggling to differentiate itself from the smartphones that bring as much processing power to the mobile gaming market as handhelds, Nintendo is continuing to go all-in for the 3D value add. 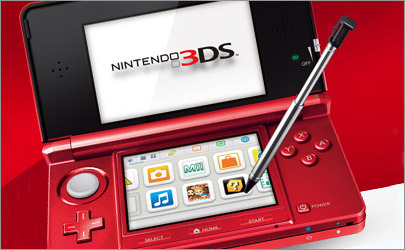 An update to the console’s operating system by the end of November will enhance the 3DS functionality. Users will be able to record up to 10 minutes of 3D video on the multi-camera device and can make stop action films, as well. The company is also pumping up its downloadable video library with 3D fare, such as a Shrek character “Thriller” video and 3D music videos. Nintendo is feeling the smartphone pinch from all sides. This summer investors in the company urged the game maker to start developing titles for smartphones. The company has taken a hard line stand against migrating its famous Mario, Zelda and Yoshi franchises to third-party hardware. Traditionally, Nintendo’s view has been that software drives hardware sales and loyalty. To separate the two is to risk a fatal decline for a company that virtually built the original home video game market.